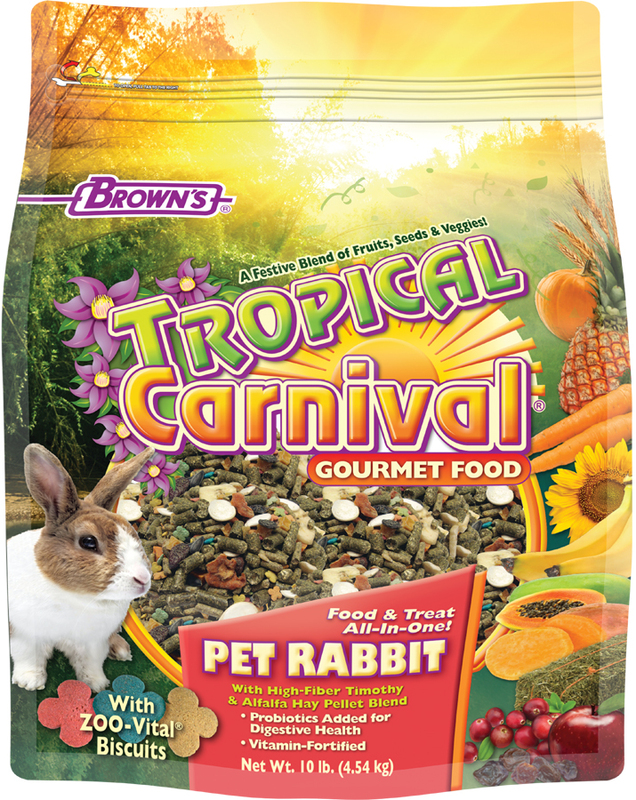 Tropical Carnival Rabbit food is a vitamin-nutrient-fortified food and treat, all-in-one. This premium gourmet food is specifically formulated for the daily dietary needs of rabbits, jam-packed with a medley of delicacies. 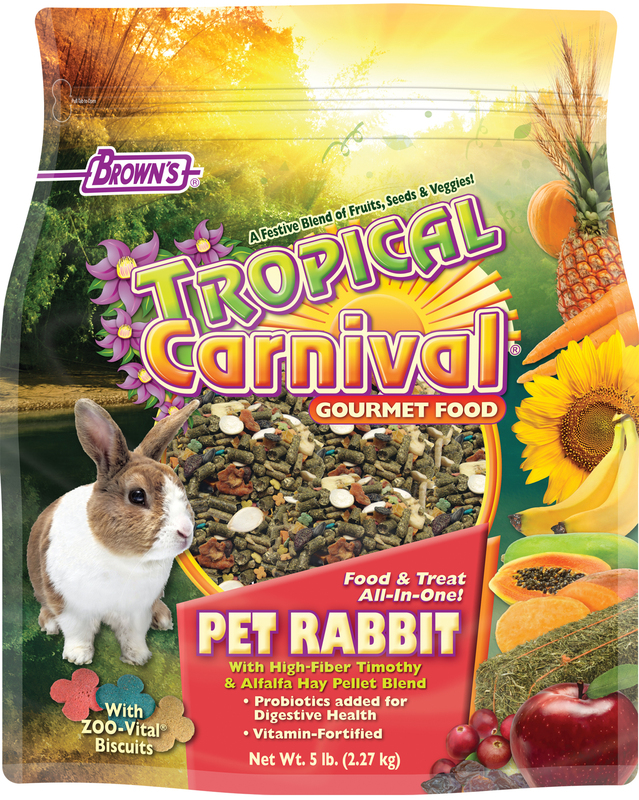 Tropical Carnival Rabbit food is a vitamin-nutrient-fortified food and treat, all-in-one. 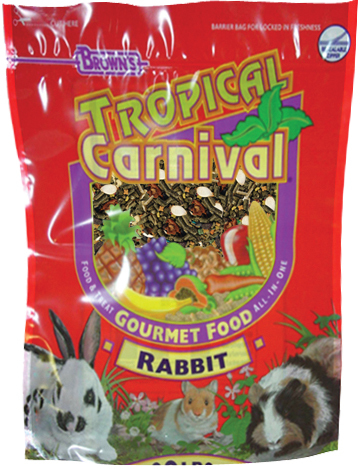 This premium gourmet food is specifically formulated for the daily dietary needs of rabbits, jam-packed with a medley of delicacies. 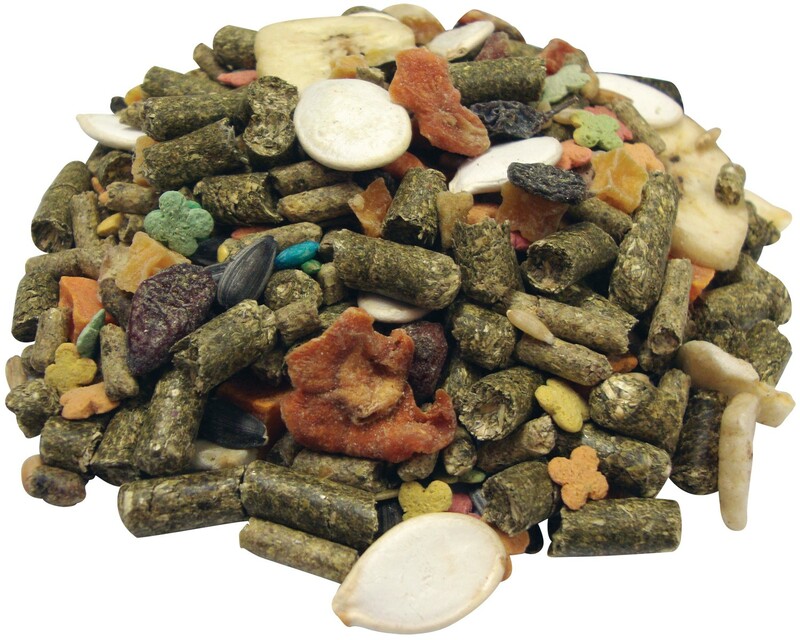 We have included fiber-rich Timothy and Alfalfa Hay Pellets and beneficial bacteria to support good digestion, the perfect sized bites of fruits, veggies seeds and grains, plus our nutrient-rich zoo-vital biscuits. 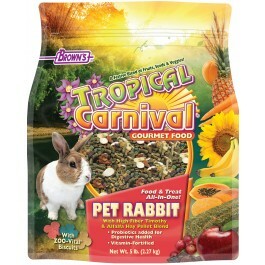 Your rabbit will find Tropical Carnival simply irresistible. Ground Timothy Hay, Dehydrated Alfalfa Meal, Oat Groats, Dried Papaya, Dried Pineapple, Wheat, Sunflower Seeds, Dried Carrots, Dried Banana, Raisins, Dried Sweet Potatoes, Pumpkin Seeds, Dried Apples, Dried Cranberries, Wheat Middlings, Soybean Meal, Ground Corn, Ground Oats, Ground Soybean Hulls, Corn Distillers Dried Grains with Solubles, Wheat Flour, Corn Gluten Meal, Soybean Oil (preserved with Mixed Tocopherols), Dicalcium Phosphate, Salt, Calcium Carbonate, Brewers Dried Yeast, L-Ascorbyl-2-Polyphosphate (Source of Vitamin C), Lignin Sulfonate, Choline Chloride, DL-Methionine, Zinc Oxide, Menhaden Fish Oil (Source of DHA & Omega 3 Fatty Acids), Fructooligosaccharide, L-Lysine, Vitamin A Supplement, Mineral Oil, Ferrous Sulfate, Vitamin D3 Supplement, Vitamin E Supplement, Niacin Supplement, d-Calcium Pantothenate, Vitamin B12 Supplement, Menadione Sodium Bisulfite Complex, Riboflavin Supplement, Pyridoxine Hydrochloride, Folic Acid, Thiamine Mononitrate, Manganese Sulfate, Dried Pediococcus acidilactici Fermentation Product, Vegetable Fat (preserved with Mixed Tocopherols), Biotin, Lecithin, Sodium Selenite, Ethylenediamine Dihydroiodide, Copper Chloride, Yucca Schidigera Extract, Rosemary Extract, Artificial Banana Flavor, Colors Added (Titanium Dioxide, Beta-Carotene, Red 40, Blue 1, Yellow 5 and Yellow 6) and Sulfur Dioxide (a preservative).